Have you ever utilized a service that fell short? Or, bought a product that fell short? Maybe an easier example… Ever been to a restaurant that fell short? The logo or ad looked great, but the experience didn’t meet the expectations of what was advertised or marketed to you? We’ve dedicated ourselves to fully understand why this happens. There are 8 steps to a brand experience. The simplified version comes down to these 3 steps: Before / During / After. The problem is that a lot of agencies focus on the Before (such as advertising, marketing, or the brand identity – think logo and visuals). That leaves the During and After to fall short. We call this Surface-Level Branding. As a business, you should avoid this short-sighted thinking. 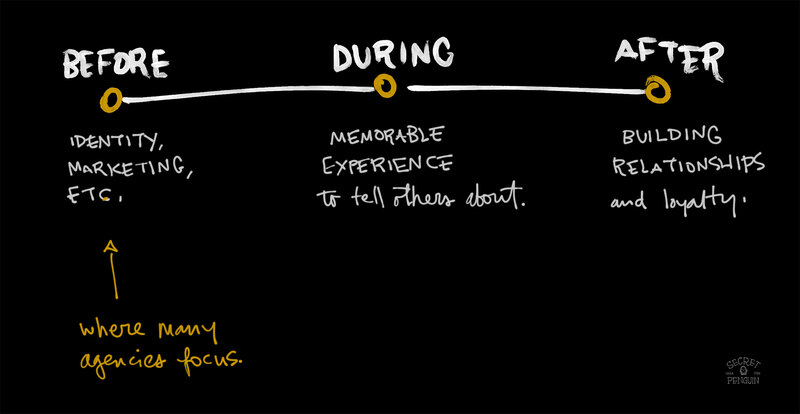 We believe you should think of the whole customer experience from beginning to end… really from Before / During / After. It goes deeper than a logo. It goes deeper than an ad. It goes deeper than who you hire. A brand experience is the result of an overarching roadmap for how everyone (your team and customers) will experience your brand. As a result of having this roadmap, our clients advertise less and get more word-of-mouth because of the consistent and remarkable experiences they give their customers. We’ll break down the basics of what needs to happen at each stage over the course of the next few posts. Sign up to be notified of the next one!